As the leading localization firm, XLsoft has been providing a wide range of localization services since the era of MS-DOS operating systems. Our services are not limited to localizing software and translating documents; we also organize technical seminars for localizations and offer consulting services for companies seeking to localize their products into Japanese. XLsoft has localized and distributed many innovative localization tools, such as the bestselling Windows help authoring tool RoboHelp, into the Japanese and Asian markets.We are well trusted in introducing groundbreaking products to the Japanese market. At XLsoft, we never stop searching for the new products to improve the quality and efficiency of localization, such as translation memory tools (e.g. 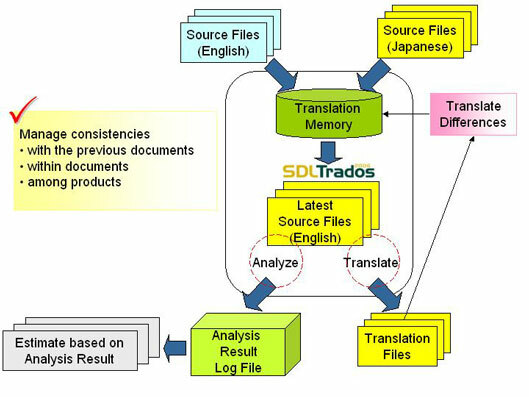 TRADOS, SDLX) and software localization environment (e.g. Alchemy Catalyst), and introducing them to the new market. XLsoft tied a business partnership with Intel Corporation in 1997. As the master distributor of Intel products in Japan and APAC, we have been distributing Intel software development products to developers all around the world.Together with Intel KK Japan, we now offer Intel(R) Software College courses in Japan. XLsoft not only distributes localization and translation tools, but also utilizes them in our in-house localization projects.By taking full advantage of the latest technologies, we offer efficient, high quality services to our clients.This is one of the reasons why we earned a reputation for offering accurate, high quality, tailored translations and localization. XLsoft offers localization and translation services for English, Japanese, Chinese (Traditional/Simplified), Korean, French, Spanish, and other languages.The fields of our expertise range from general/business documents, to application manuals, whitepapers, and advanced technical documents.We have many accomplishments and rich experiences, especially in the translation of software user's manuals and computer related documents. Below are some of the clients who chose XLsoft as their localization, testing, and consulting service provider. Before requesting an estimate, please read Estimate/Sample. XLsoft offers complete localization services for English <-> Japanese, from the internationalization of programs to translation of manuals and helps. Our experienced, in-house team consists of project coordinators, graphic designers, translators, linguists, technical reviewers, QA experts, and software engineers. We have resources to accommodate all the works in-house, which minimizes overhead times and ensures smooth coordination and direct communications throughout the entire processes. Localization comprises of a wide range of services, including software localization, website globalization, manual/help translations, QA testing of language environments, etc. With over two decades of experience, XLsoft offers complete localization services, including those mentioned above as well as software publishing, graphic translations, help creation, and help conversions. Our expertise is not limited to translation; our rich knowledge base includes problem solving know-how for program internationalization, consistency management for manual/help contents, and tailored translations (idiomatic translation when more appropriate). Taking pride in our accomplishments and experiences, we provide reliable, accurate, and high quality services. Unless a source code needs to be modified, we use tools such as Alchemy Catalyst for program localization. These tools allow editing of EXE/DLL/OCX files even if a source file is not available. At the time of a newer version release, only the updated parts need to be edited; hence, it can be done quickly, accurately, and at a lower cost. For translations, we utilize translation memory tools to prevent inconsistencies such as applying different translations to the same original phrase. If the similar phrases (fuzzy matches) exist in the translation memory, the tools show them automatically to maintain the consistency of translation among similar phrases. We can use the translation of the same segments and translate only the different segments. Our experienced translators determine the most appropriate translation for each phrase. If it is more appropriate, different translations are applied to the same original phrase. Whenever possible, translation memory tools are used for program translation as well, to maintain the translation consistency. Translations must be accurate and easy to understand. Localization generally involves local jargon. If a translator does not understand the meanings of the original phrases, the translation is likely to be inaccurate or awkward. Likewise, if a program resource is translated in the same way as documents are, the translation may have completely different meanings. At XLsoft, an experienced in-house team of translators, linguists, technical reviewers, QA specialists and project managers will work on their field of expertise, and together offer accurate, high quality, and easy-to-understand translations. XLsoft is a leading localization firm with a reputation for providing quality services quickly and efficiently. In order to improve quality, reduce turn-around times, and lower costs for our clients, we are always keeping an eye on market trends and new technologies and actively searching for new tools and methods. 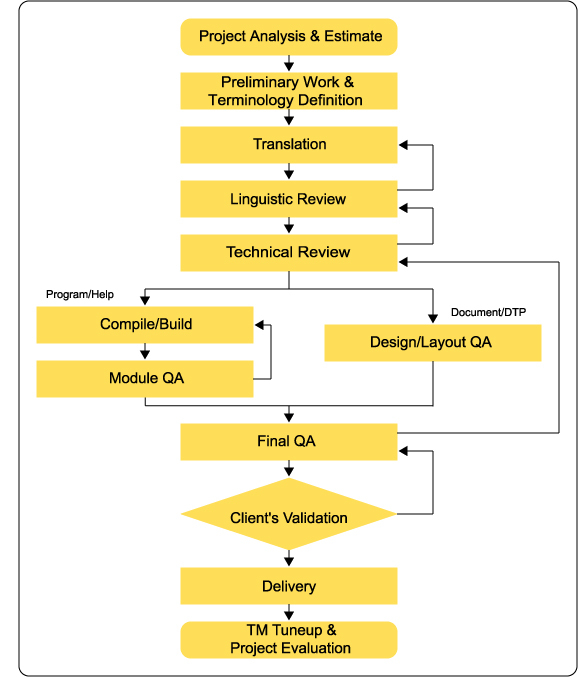 The following diagram illustrates a general localization process flow. Using the latest translation memory tools, a project is analyzed and an estimate (based on the analysis) is prepared. Before starting the translation, the translation memory from the previous version is tuned up. If the translation memory is not available, but the original and target source files for the previous version are available, we can create the translation memory by aligning the source files. (Depending on the source file types, we may not be able to create the translation memory. Please contact us for details.) Also, terminologies are to be defined to maintain the consistency of translation. Using the updated translation memory and the terminology definitions, our experienced translators will translate using the latest translation memory tools. Linguists review the translation, including any careless mistakes and the use of abstruse terms. We also verify the conformity to client's translation guidelines and make sure that the translation is easy for the target audience to understand. Technical reviewers verify the accuracy of the translation, including technical terms and brandings. Also, we ensure that the translations for the same original phrase are consistent with one another. Program/help is compiled in the specified environment. When changing only the resource of a program (in other words, no modification is needed in the source code), we use tools such as Alchemy Catalyst to update the program. These tools allow editing of the resource without changing the source code. Our team of QA experts tests the behavior of each module in the program/help. For systems help, they make sure that there are no broken links in the help and a call from the program works properly. Graphic designers review and ensure the designs/layouts meet stringent customer requirements. Project coordinators perform the final check to assure the accuracy and quality of the overall project. We ask the client to examine the final output upon final delivery to ensure it meets the client's requirement. The project is delivered if no correction/change is necessary. The translation memory is tuned up for the future use, and the project evaluation is performed. Please click here to request an estimate. At XLsoft, we use the latest translation memory tools to analyze source materials. The translation memory tools let you take advantage of the latest technology and save translation costs; word counts for repetitions and fuzzy matches are generated, and discounts are applied for them according to their concordance rate.In addition, the translation memory tools will ensure the quality and consistency of the translation; the source and its translations are stored into a database, allowing the use of the translation whenever the same or similar source segment occurs. By utilizing the translation memory technology, we offer high quality, reliable services quickly at a lower cost. Please contact us for details. When you contact us, please select Localization/Translationfrom 1. Question Type on the Contact form and fill in the form. XLsoft K.K. Japan and XLsoft Corporation (U.S.A.) offer consulting and assistance for both Japanese companies seeking to expand their business to overseas and foreign companies seeking to start a business in Japan. If you are interested in localizing your computer software products into English or Japanese, please contact us from the link at the bottom of this page. Consulting that utilizes the latest Power Tools and Utilities distributed by XLsoft. XLsoft Corporation is located near Los Angeles, California, U.S.A. We have experienced in-house bilingual engineers, graphic designers, translators, and consultants to accommodate your business needs. With an overlap of over three business hours between Japan and California, we can sync up projects between both offices while also supporting our worldwide customers.